There’s no such thing as getting enough of a band that travels with you through time & space. Hale stands out from being our high school sweetheart to our remedy in facing our adult life woes. They’ve wrapped us around a force field of nostalgia that can only be solved by serenading us with a broken sonnet. As they’ve crafted sentimental lyrics and melodies that will give you a case of last song syndrome, they know which memories to point back to your head to make you reminisce the best or worst days you’ve had. Five years can do so much as a test of faith in time, and these four have proven that distance only makes the heart (and structure of music) grow fonder. 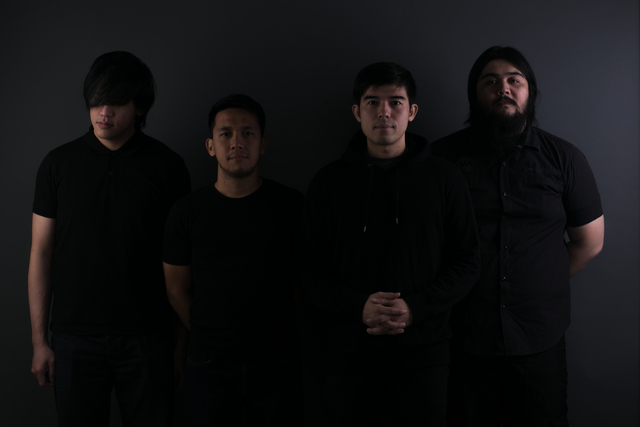 We caught up with vocalist and lead guitarist—Champ Lui Pio and Roll Martinez—behind the curtains to talk to us about the value of Filipino music, his dream music festival, and their first show in Singapore. Also, we got a chance to take a big peek of their music video for "You and Nothing" - a track off Time & Space, featuring Jessy Mendiola, that will be released around late April 2016. It's worth keeping your eyes peeled for, and a box of tissues on the side will do in case you forget where to place your dripping feelings. It’s been more than a year since Hale’s comeback, how have all you been? Champ: Really good. Ah, it’s a constant compromise or balancing act. It’s really okay. I can’t say anything else but we’re so much better now than when we first launched. ‘Cause when we announced the comeback, there was still this awkwardness from being apart for five years. But now after a year of gigging and always seeing each other, it’s like the magic is back. The heat is back. What are your insights on the Filipino music scene lately? Champ: I think it’s still in the process of restructuring because music now isn’t like what it was before back in 2005 where music and TV are integrated. Now it’s just TV and social media or TV and the internet, like music and social media or music and the internet, that’s the combination right now. So the landscape of music is in that state of transition and I actually like it because it’s a neutral ground for everyone, whether you’re a major act or an indie act, or someone who wants to play in your room. The scene is open for everyone. You don’t need to be backed up by a label - the internet is the great equalizer. At times, the internet is the label of the artist. Champ: Exactly! It’s really interesting how music will evolve because even the platforms now, they’re transitioning from downloads to streaming and there are just a lot of avenues. It’s like a double-edged sword; like it can be good and it can be bad ‘cause you don’t have focus compared to before. People can easily switch from a page to another or an app to another, but I guess it really boils down to the artist. It’s their job to create something compelling. You know, the scene here in Manila is so small that if there’s a really good song, it’s impossible for it not to come out. It’s that small and it’s a challenge to the newer bands or even to the established bands to create something because right now it’s kind of in hibernating mode. It’s only a matter of time before the scene will explode again. As Filipino music evolves along with the bigger picture, how do you put quintessential Hale into your current and future mixes? Champ: We’re trying to figure it out because we don’t want to evolve into something too far from who we were before. Actually, we had a teambuilding session during Holy Week. We admitted that while we were recording Time & Space, there was that awkwardness while we were rehearsing. But, we recently started writing new songs and we plan to release these hopefully next year and I guess that will define who we really are. I think it’s really the upcoming album because after gigging again and after connecting again for a year, the vibe now is so different. We’re creating something we didn’t really expect and we actually admitted that “hey, Time & Space is the transition album”. We’re really curious ‘cause I’ve been writing, Roll’s been writing and we’re aware of what’s currently going around the younger crowd. I’m curious as well to how we’ll transition, how we’ll present ourselves in the new album because I think that whole compact phase in one year was all about just reminiscing the old songs, but I think that time is over. I think it’s time for something new to be offered and be the banner of this new chapter. It’s like the rebirth of Hale! Champ: Yeah, something like that. We thought Time & Space was that album but it’s really just a transition album. We only had six songs and we couldn’t really come up with more. We just didn’t want to announce the comeback without anything good to promote but now we have a different level of cohesion with everything else that has happened. I can’t think of definitive answer to that. It’s all a constant work in progress. Five years is quite a long time to be apart, and having the certainty of coming back validates how important it is for all of you. What keeps you guys tightly knit to the industry? Champ: I guess that it’s because at the end of the day, music is always in our DNA. It’s our life. During the five-year hiatus, we were all still in the industry. Roll was still producing for other artists --- he has a studio and he still writes songs for other people---I was managing artists, Sheldon had another band, and Pao was with Kjwan. It was only a matter of time when we were all ready to reunite but we never turned our backs away from the scene. We really love music. This time around, I think we’re all on the same page that we want to make the second time around sweeter or just better. We’ve had misunderstandings. We’ve learned from that and this time around we’re just more level-headed with each other. In your opinion, what about Filipino music would help propel it to an international level? Champ: I think we should target regionally first. We’re having tie-ups, like artists from different countries play here. Recently we had an Israeli jazz artist play here [at 12 Monkeys]. It’s more realistic to reach out to a more regional scope first than international. But I really like that we’re having a lot of festivals here that fuse local and foreign acts together. Because that gives artists, like BP Valenzuela for example, an avenue to really showcase people who have never heard of her or has no idea of her music. [In a festival], people are there to enjoy music and it’s a nice avenue for artists to be heard in the scene and establish connections. I’m happy that these festivals are not just prioritizing established acts like us or Up Dharma Down; they’re giving these young acts a chance to be heard. I was there at GoodVybes and they got a lot of Logiclub people to play. They represent those young musicians, they’re the new generation. They haven’t transcended out of that niche but eventually they will because the industry is constantly evolving, the landscape is changing and eventually when people migrate more to social media, there’s gonna be a role reversal. Because you can see all these music channels migrate their content from TV to the internet and once the majority have migrated, that’s when I think that whole revolution will happen. There’s a division and the younger generation don’t even watch TV. Roll: Yeah, we feel like we [Hale] can, not just regionally but on a global scale. It's not an easy task but we are optimistic as we are hardworking so anything is possible. If you were to organize your own festival, or your dream concert with your band, who would you want to put in the lineup? Champ: I’m a huge Coldplay fan. International for me personally would be Coldplay. I think it shows in their music like the influence is really strong there. Locally, I’m a huge Rey Valera fan. That would be like a dream gig for me. Somedaydream, also. I’ve gotten close to the Logiclub people and I like their division. I’m not being biased, they’re very idealistic. It’s a breath of fresh air for me. How are you all preparing for your first show in Singapore on the 16th of April? Champ: To be honest, I’m really pressured because it was supposed to be in a small bar then the producer changed it into SCCCI. We’re doing our best to promote the show and we’re going to probably play all the singles we’ve released in a really long set and make it all nostalgic. Roll: There really isn't much [expectations] except for ourselves. We expect to be the best we can be and put on a good show for the people who'll watch. "I'm fine with the list being credited as the band's. They're pretty much common ground anyway," shared Roll as he hand-picked Hale's list of top 5 influential albums. This record is absolutely beautiful. It's a masterclass in melody and harmony. It still holds its own to this day. Everything about this record is great. Greg Alexander is a phenomenal songwriter. This is the old friend that will always be there for you even if you haven't seen her in years. The band and the songs are very seminal. Ben Gibbard and Jenny Lewis. Solid from top to bottom, sublime from start to finish. This one wasn't officially released but it was very integral in our musical upbringing. From The Cranberries, Gin Blossoms, Oasis, Blur, The Lemonheads and The Smashing Pumpkins, this bootleg compilation was everything for a broke high school student going into musical puberty. Hale plays Summer Siren Festival on April 8, Paradise International Music Festival on April 9 and their first Singapore show on Saturday, April 16 at SCCCI. Tickets are still available here.